Need Mid-Winter Comfort? This Goulash Recipe is Sure to Chase Away the Blues. Our friend Stephen loves to cook and come up with new recipes, as well as his own take on old favorites, for his family and friends to try. Recently, we were visiting him on a chilly winter night. He invited us to stay for dinner and enjoy some of his homemade goulash, which he served with a side of crusty bread and butter. It was a delicious, comforting meal and we left with full tummies – and his recipe! He said he’d be more than happy if we shared it with our Charlie Johns family – we hope you try it and are sure you won’t be disappointed! Enjoy! • Cook macaroni according to package instruction; drain, rinse and set aside. • In a large pan, cook hamburger until browned; drain any excess fat. • Add flour and stir to coat the browned meat. • Add the canned tomatoes, celery and onion; stir. • Cook mixture over medium heat until vegetables are translucent. 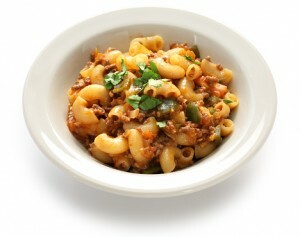 • Once vegetables are cooked through, add macaroni and stir to completely combine all ingredients. • Heat until macaroni is warm throughout. • Serve with warm rolls or crusty bread for a filling meal. You can find all the ingredients you need for this recipe right at Charlie Johns in Speculator, N.Y. From our quality produce, to the best, freshest meats, to our delicious in-store bakery, we have everything you need to create this hearty winter dish, or one of your own! Stop by and see what we have “in store” for you!